Fast food may not be your first choice for a romantic dinner, but Burger King has a new promotion that hopes to change that. 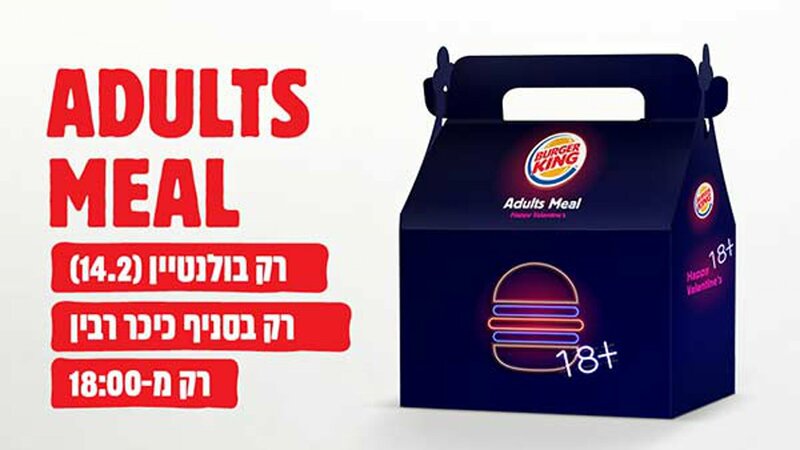 Burger King Israel is trying to lure couples this Valentine's Day with their new "Adults Meal," complete with an adult toy. According to AdWeek, the meal comes with: two Whoppers, two packs of French fries, two beers, and an adult toy. Burger King Israel doesn't specify what the adult toy is, but an ad posted on their Facebook page shows three possible options: a blindfold, a feather duster, and a scalp massager. The "Adults Meal" will only be available after 6 p.m. on Valentine's Day to Burger King Israel customers who are 18 years or older.